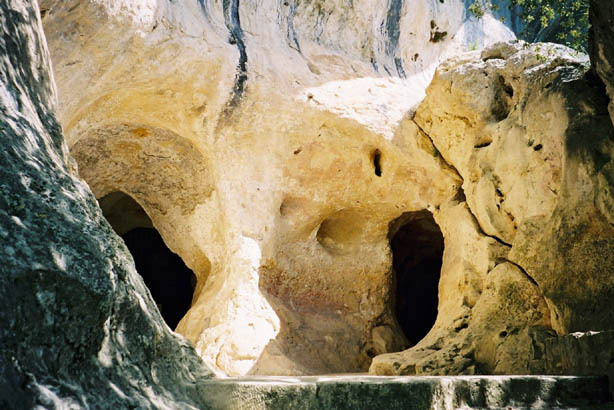 Les Eyzies is the single most important cave and abri area in the world, and from this point you can spend two weeks visiting very important archaeological areas in the immediate vicinity. 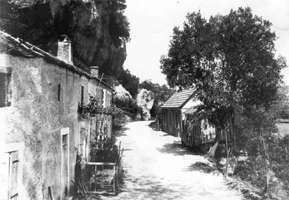 (Left) View of the dirt road at Les Eyzies, Dordogne (southwestern France), circa 1910. Otto Hauser's home is on the left, the so-called "head-quarters," and on the right is his museum and the garage. (Right) Hauser's "headquarters" in 1999. Magdalenian occupation sites in the Pyrenees. 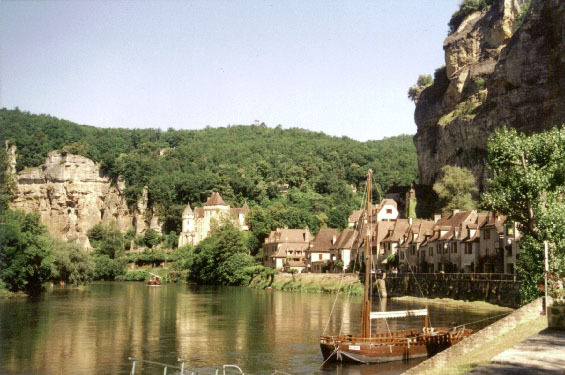 In the Dordogne region only the two best-known sites have been marked. The 1 000 metre contour is shown. 1. Isturitz, 2. Duruthy et les sites voisins, 3. Labastide, 4. Enlène, 5. Les Trois Frères, 6. Le Tuc d'Adoubert, 7. Le Mas d'Azil, 8 Le Portel, 9. La Vache, 10. Les Eglises, 11. Fontanet, 12. Les sites de Laugerie, 13. La Madeleine. Calcite crust broken by the impact of fingers, la grotte de Fontanet. 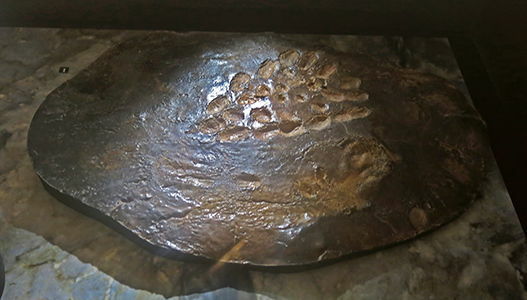 Imprint of a child's hand, la grotte de Fontanet. 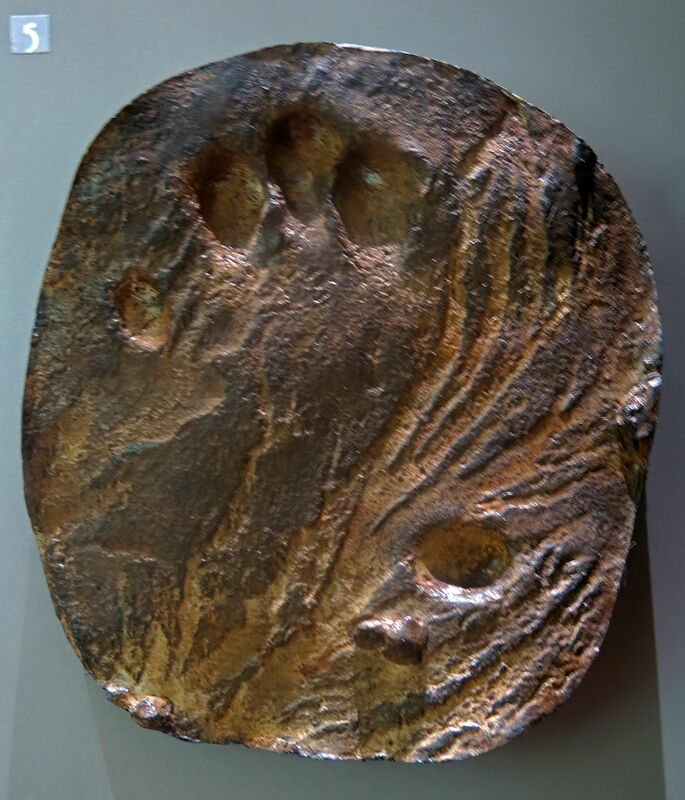 Holes pressed in the clay by fingers, and the imprint of a foot wearing a soft shoe, la grotte de Fontanet. Holes pressed in the clay by the ends of the fingers of the left hand, la grotte de Fontanet. 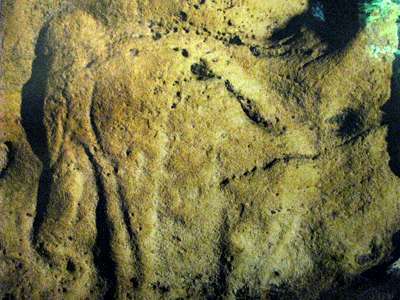 The imprint of a hand and a foot in clay, la grotte de Fontanet. 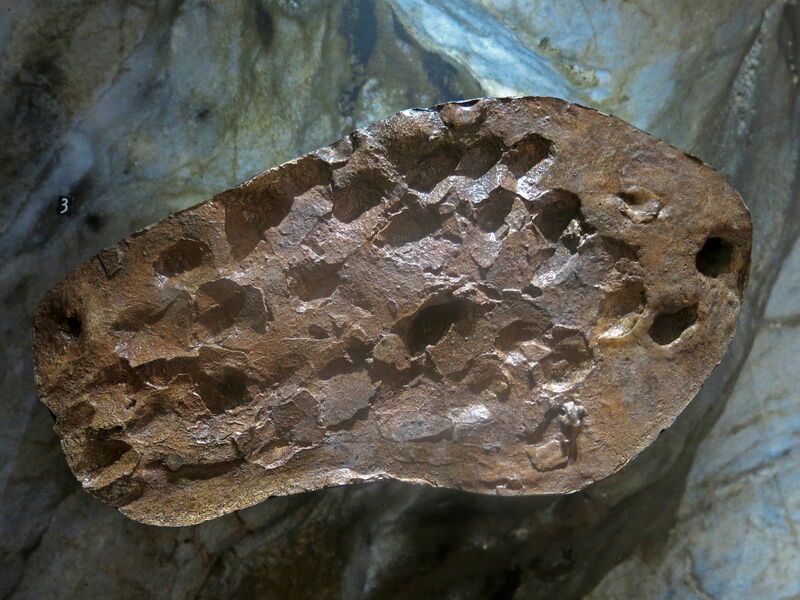 Fingers pressed these holes into the clay in a carefully made line and grid pattern, la grotte de Fontanet. This is the river that Ayla and Jondalar travelled down at the very end of POP to get to the Ninth Cave, home of Jondalar, which is on its banks. 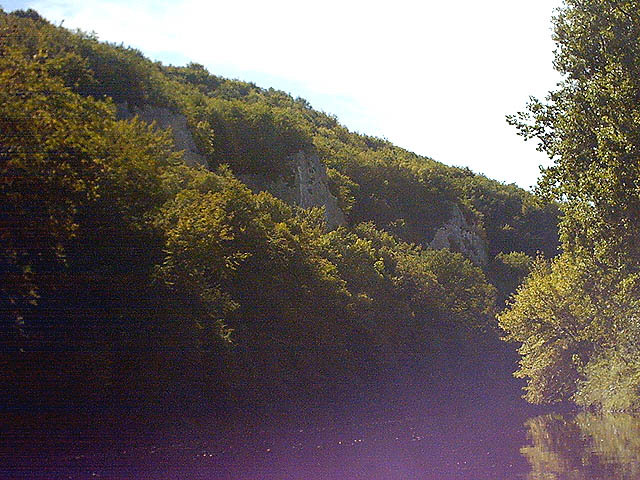 There are many caves in the limestone cliffs along the course of this small river, used as human habitation since old stone age times. 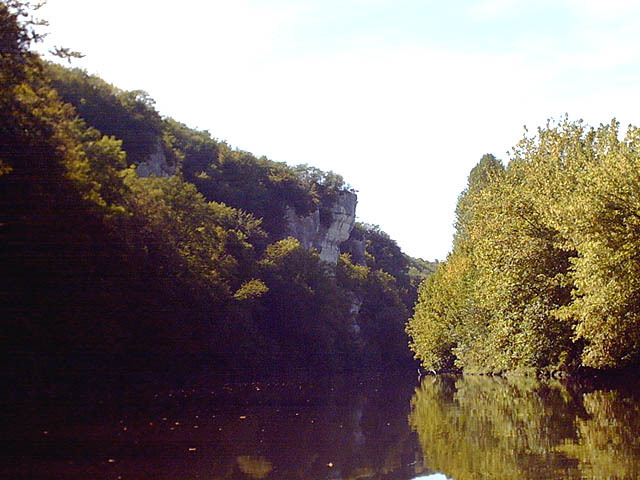 Vezere River - "La madeleine". These are objects gathered on a walk beside the river, indicating things that may or may not have been available 20 000 years ago. 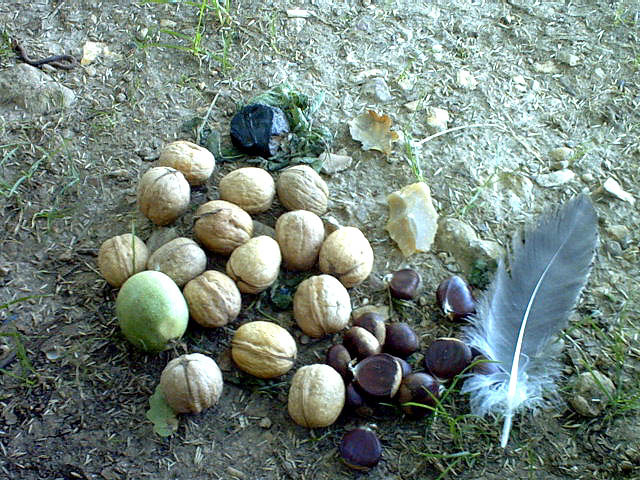 The nuts are walnuts and chestnuts, and the goose feather would have been good for fletching an arrow or spear. The evolution of a rock shelter and its deposits. When a zone of weaker rock underlies a stronger stratum, frost weathering (freeze/thaw cycle) cuts away the softer rock, creating a rock shelter. 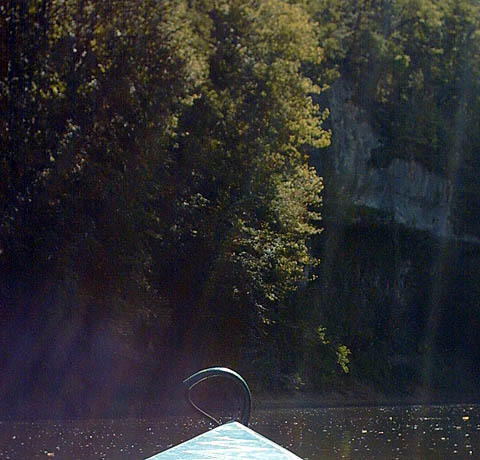 (The initial formation and subsequent undercutting of a cliff can also be caused by a river.) When this provides enough shelter, it becomes occupied. The roof periodically falls, covering the occupation material of bones, ash, and artefacts with rock and dust, the shelter is reoccupied, and the cycle continues until the rock shelter becomes completely filled in. It would be hard to think of a better method for preserving fossils from the stone age than this, though it is tough on any inhabitants at the time of the rock falls. 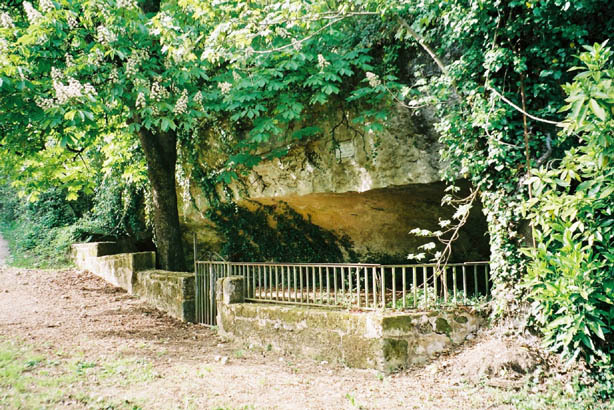 The Cro-Magnon shelter, the abri where the type specimen for Jondalar, one of the characters from the series on the ice age by Jean Auel, was found. This cave has never been closed by natural causes, as Lascaux was for example, which explains the bad state of the paintings. 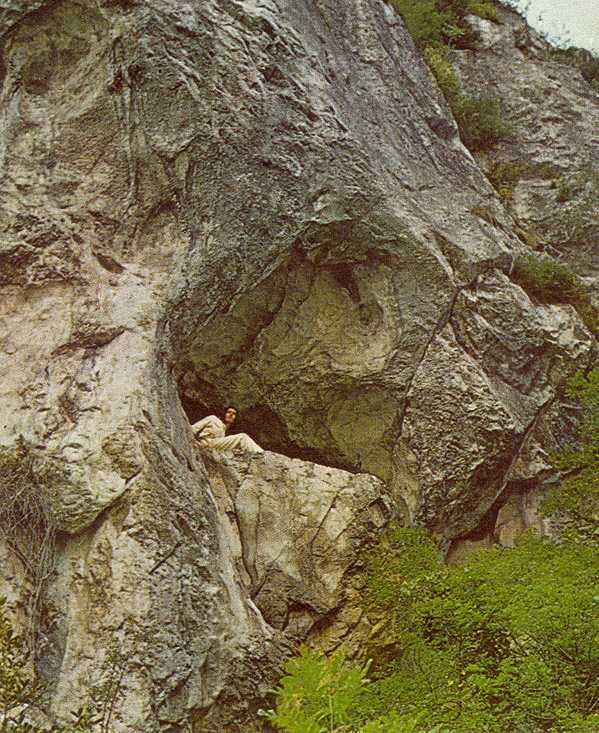 Though paintings are everywhere in the cave, they have not been seen (again) before 1901 (by the man who also discovered Combarelle a few weeks before). Kids of Les Eyzies used to play there and they carved their names and dates on the walls, sometimes destroying what the (supposed) Magdalenians did. Added to that, water deposited some calcite on the walls, hiding most of the paintings-carvings. Painting of a wolf in Font de Gaume after Breuil, from a postcard. My thanks to Anyasun for bringing it to my attention. What is so special with Font de Gaume is that the animals are carved, then painted inside the carving. It's a great thing, because if the paint disappeared, most of the carving can still be seen. 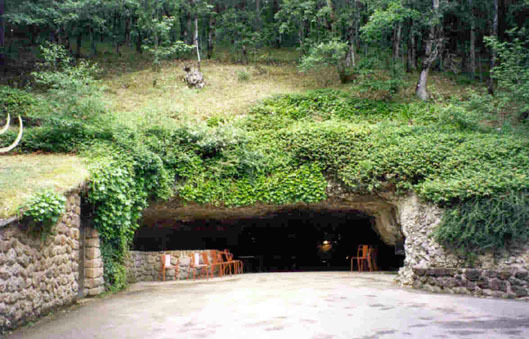 Recently, about 3 years ago, they renovated the ground of the cave for tourists. Before doing that, they studied the walls again, to be sure they did not miss any paintings. And they discovered something like 180 new 'things', from animals to simple signs. Most of them are behind a layer of calcite, and can be seen only with a UV or IR light. Utika says 'the guide showed the visitors a really cute little mammoth, about the size of my hand that they missed before. That is also then that they discovered the wolf. Only the carved part of that wolf survived' The entrance of Font de Gaume is on the right. On the left, it's only a small cavity - small compared to the cave itself (nowadays used to leave bags, and everything that could touch the walls by mistake during the visit). This is the natural shape, but they modified the floor to make it flat. 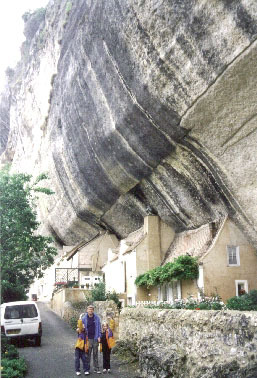 This is a big rock near the entrance of Font de Gaume. Ayla (from the book 'Shelters of Stone' by Jean Auel) says it looks like the face of the Mother. 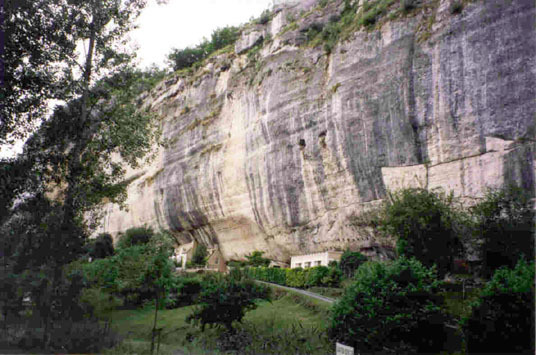 Abri Pataud consists of an immense balcony of a hundred metres length where Cro-Magnon man lived, hunted and gathered. They were seminomads. Abri Pataud was excavated between 1953 and 1964. 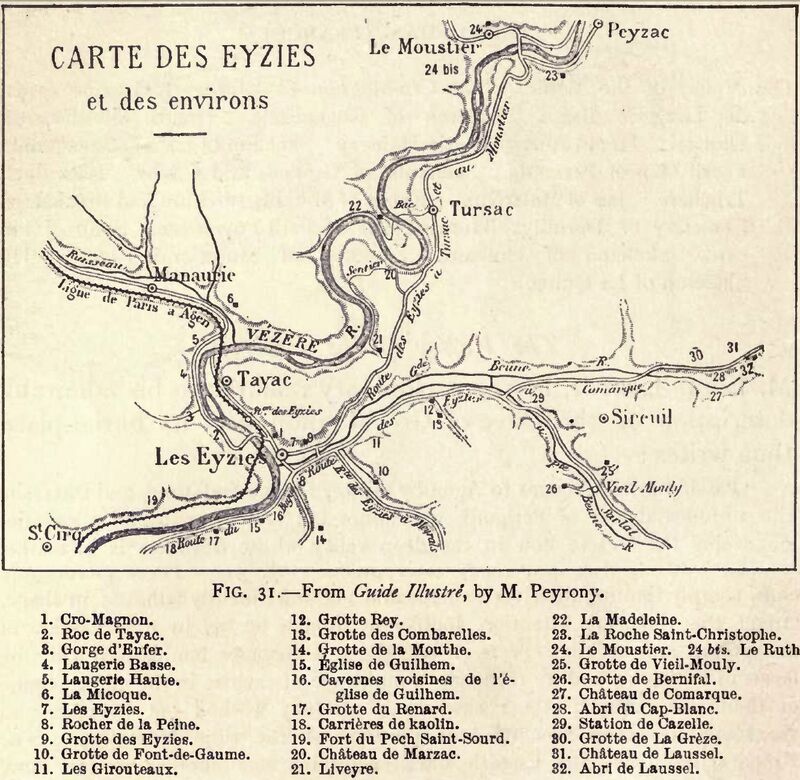 14 archaeological layers with altogether forty successive campings of hunters of reindeer, who settled on 20 000 year old sites under the cliffs of Les Eyzies were discovered. 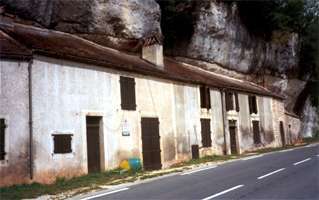 The site and museum is in the village of Les Eyzies. A Sorde-l'Abbaye, près de la ville de Peyrehorade, fut découvert un site magdalénien (fin du paléolithique supérieur) au pied de la falaise du Pastou. La terre a livré baguettes en os, pendentifs et lampes lesquels sont conservés à l'Abbaye voisine d'Arthous, sur la commune d'Hastingues. A remarkable campaign of research has revealed a great deal about one Magdalenian settlement called Duruthy, located in a commanding position on the fringes of the French Basque country. 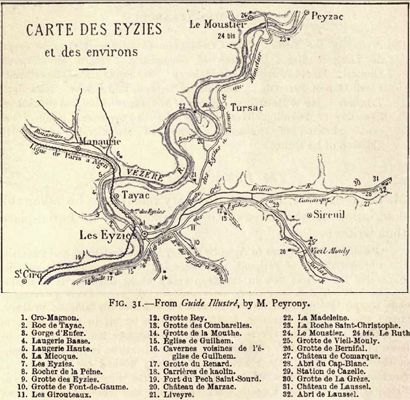 The river systems of the extreme southwest here converge on the great estuary of the Adour, which in its lower reaches formed a broad, boggy, and impassable barrier to traffic until recent times. The first convenient crossing point of the river system in prehistory must have been in the vicinity of Duruthy, and it is not surprising that this area of the Oloron valley shows signs of intensive activity at almost every period. From the top of the Pastou cliff, high above Duruthy, one looks out to the south over the curve of the river, the tumbling green pasture of the Basque hills, and beyond to the high crests of the Pyrenees, often lost in cloud or haze. At this excellent lookout point, the captain of the local garrison at Dax discovered traces of Iron Age fortifications in 1872, including a gold bracelet inside one of the camps. This encouraged him to search the area thoroughly, and he came across the rubbish deposits of four prehistoric settlements, strung out in a line at the foot of the Pastou cliff, including the site of Duruthy. Two years later, the pioneer prehistorians Louis Lartet and H. Chaplain-Duparc dug into part of the heap of debris at Duruthy and found a late Paleolithic burial accompanied by a necklace of fifty pierced lion and bear teeth, most of them engraved with curious abstract signs and the occasional animal motif. 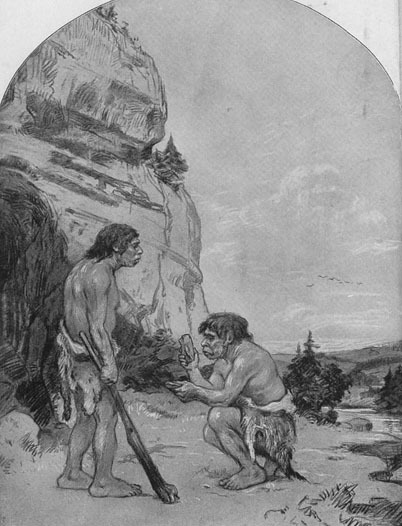 Duruthy was subsequently neglected until 1957, when archaeologist Robert Arambourou visited the site and, among other stray finds, picked up fragments of a human jaw lying on the surface. He was so impressed with the debris that he acquired permission to dig the site, and every year up to the present, he has devoted intense, and at times solitary, efforts to his investigation of the site. In recent years, the contributions of experts in soils and animal bones have greatly added to the interest of Arambourou's painstaking work. 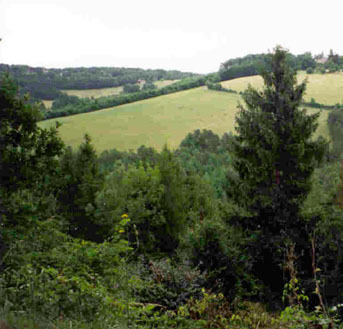 There may be as much as 30,000 years of Ice Age occupation represented by the layers at Duruthy, but so far only the settlements of the Magdalenians have been revealed, covering the last 4,000 or 5,000 years of this period. The record begins in about 13,000 B.C., when the visits of the Magdalenians to the site were apparently of brief duration, perhaps no more than temporary halts in the course of hunting expeditions. This was during a period of intensely dry and cold conditions, when only a few pines grew in the valley. Herds of wild horses must have grazed in this open landscape, for they were the chief quarry of the Duruthy hunters. They may have been discouraged from sheltering too regularly under the shallow overhang because of the frequent avalanches of boulders, fractured from the cliff face by frost and ice. From about 12 000 B.C., a warmer and more humid climate prevailed; the pine trees multiplied, and they were joined by other such species as alder, hazel, birch, and willow. For a period of 500 years or so, settlement continued at Duruthy, but it was punctuated by a dozen long intervals when the hunters were apparently installed elsewhere. During their stays, the people of the Magdalenian IV culture now mainly hunted bison, and later on horse and reindeer became important. Discarded seashells and a few teeth of dolphin were presumably "souvenirs" collected at the nearby coast. The people of Duruthy were now also making or acquiring exquisitely decorated art objects of bone and stone. 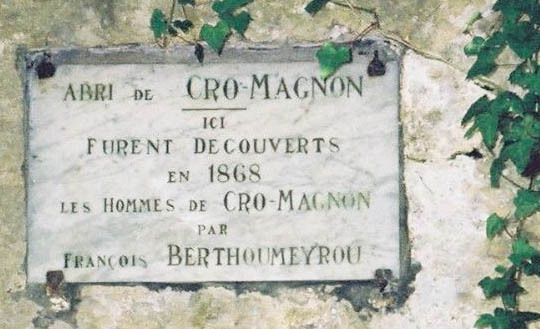 In 1961, Arambourou made an extraordinary discovery in the levels of this middle Magdalenian phase. Close to the cliff, he uncovered, all within the space of a single meter, a rich collection of art objects. 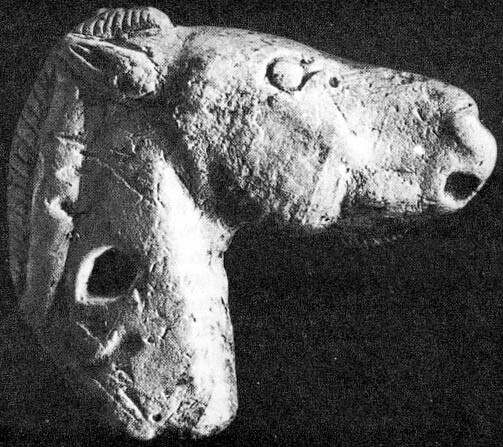 There was a fine horse head carved from white limestone and pierced as if it were intended to be worn as a pendant. 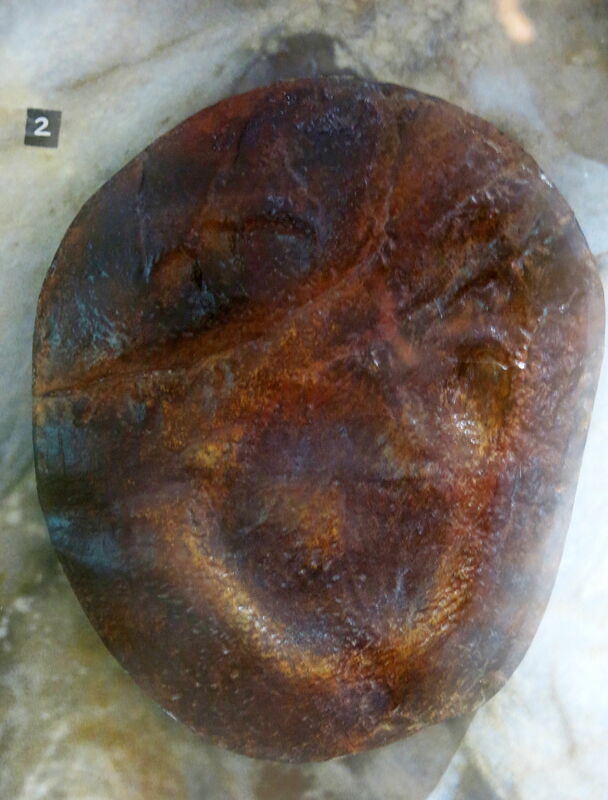 A second, less expressive horse head of ivory was found close by, and this appeared to have been treated in a more abstract style or else left unfinished by its creator. A few centimeters from the first head was a fragile little round bead of jet, which disintegrated as attempts were made to remove it. One cannot fail to be struck by the entirely hieratical character of this horse, which owes as much to the posture given to the animal as to the manner in which it is executed. With a realism which nevertheless suggests the particular rather than the general, the sculptor has, it would seem, figured not a horse, but the horse. Arambourou's speculation is supported by the fact that the horse was found lying on top of the jaw bones of two horses and up against two horse skulls. The association of all the objects found at this spot, with no trace of any human burial to accompany them, surely implies the existence of some kind of horse ritual or shrine of the middle Magdalenians. The interest of Duruthy does not stop with this period of occupation by gifted hunter-artists. A cold climate once again returned to the southwest, and the settlements of the Magdalenian V people appear to have been meager and brief. When more favorable conditions returned, by about 9,500 B.C., Duruthy was occupied by the last of the Magdalenians on a scale larger than before. Over three times the area of the slope in front of the cliff was occupied than had been settled in the days of the middle Magdalenians. This area was consolidated by great artificial pavements laid down with river cobbles in a series of terraces, perhaps to even out the slope or to make it less slippery. The pavements were rebuilt eight times by the late Magdalenians; the earliest covered the burial of a woman in her fifties, while the latest preserved the traces of post-holes on its top surface, presumably to support tentlike structures. 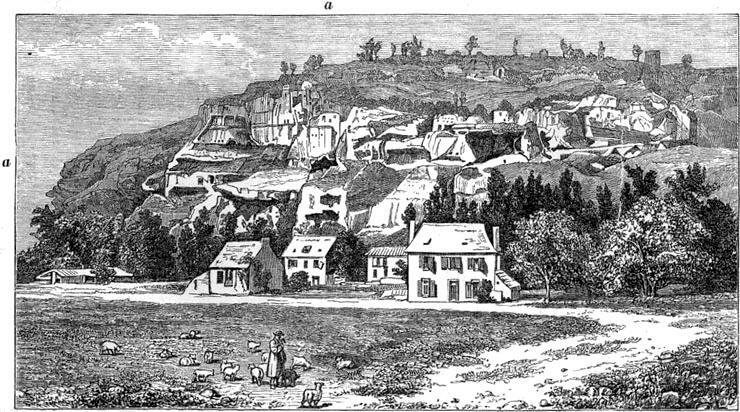 Together with the other communities installed at the four neighboring sites now known from the foot of the Pastou cliff, it seems that the population of the Oloron valley must have lived, as Arambourou puts it, in "a sort of large village." However, the occupation of Duruthy was always seasonal, during the months of September to February only, as studies of reindeer teeth have revealed. In autumn, the hunters caught salmon with bone harpoons (the backbones of the fish are constantly found with these weapons), and during the winter, reindeer was the staple. In the summertime, the people of the Oloron "village" may well have dispersed in order to follow the reindeer herds as they migrated up to the cool mountain pastures. The last Magdalenians seem to have been uninterested in the arts (although ochre crayons and pierced teeth have been found), but the quality and inventiveness of their flint-work was unsurpassed. It is difficult to convey any impression of the prolific output of the Duruthy toolmakers or of the skill and fineness applied to the basic forms; 10,000 worked tools have been studied from the Magdalenian VI layers, a large proportion of which are tiny backed blades worked on an almost invisible scale. When these bladelets were examined under a microscope, it was found that they bore traces of glue on the blunted backs, and a peculiar sheen on the cutting edge that can only have come from the cutting of grass stems. It seems likely, then, that the bladelets were cemented into a wooden or bone handle to form sickles that were used to harvest the wild grasses in the Oloron valley. Arambourou also has identified the remains of what may be stone mortars and grinders, which would have been essential for turning the grasses into palatable flour. 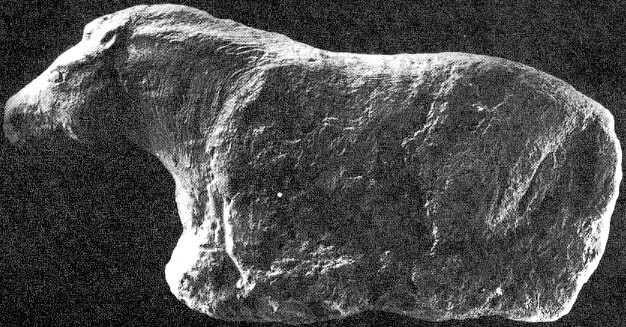 This remarkable evidence suggests that some kind of bread, porridge, or cake, perhaps cooked on hot stones near the fire, accompanied the reindeer feasts held in the shelter of the Pastou cliff. It seems as if the brilliance of the Magdalenian IV artists was matched by the technical ingenuity of their Magdalenian VI successors. Grotte du Grand Roc, distant shot. Grotte du Grand Roc, other side. 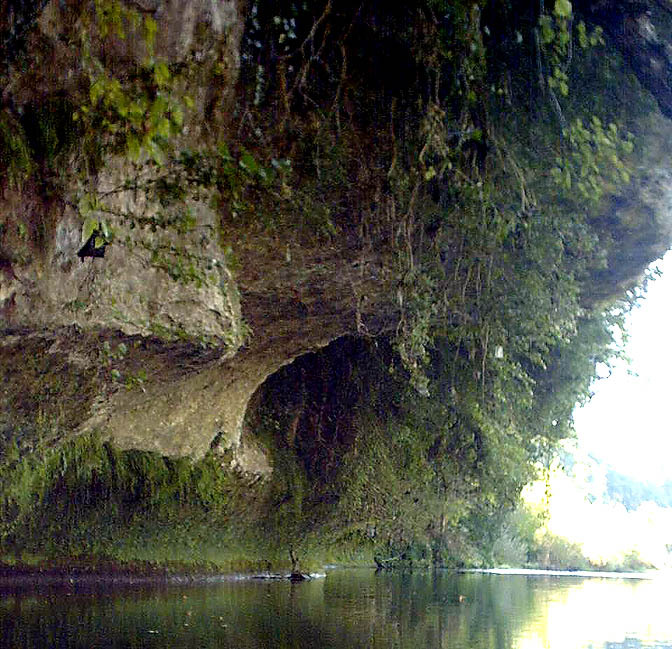 Cave Rouffignac. As you can see, the cave mouth has been extensively modified for the tourist trade. Total length of all the chambers and galleries in three levels is about 10 kms.The cave is very long, so a narrow-gauge railway with special mini-trains, consisting of open platforms each for 6-8 persons, was put in. Rouffingac paintings have not been dated yet, and there is some doubt about the authenticity of some of the paintings. Entrance to the cave of La Vache in France. Mammoth sculpted in bas-relief in the Grotte de Mammouth (or de Saint-Front) near Domme, Dordogne. It is 1.25 metres high, 1.1 metres long, and located 4 metres above the present cave floor. It went unnoticed until 1978, when it happened to be caught in an artificial light at a low angle, bringing the image into view. 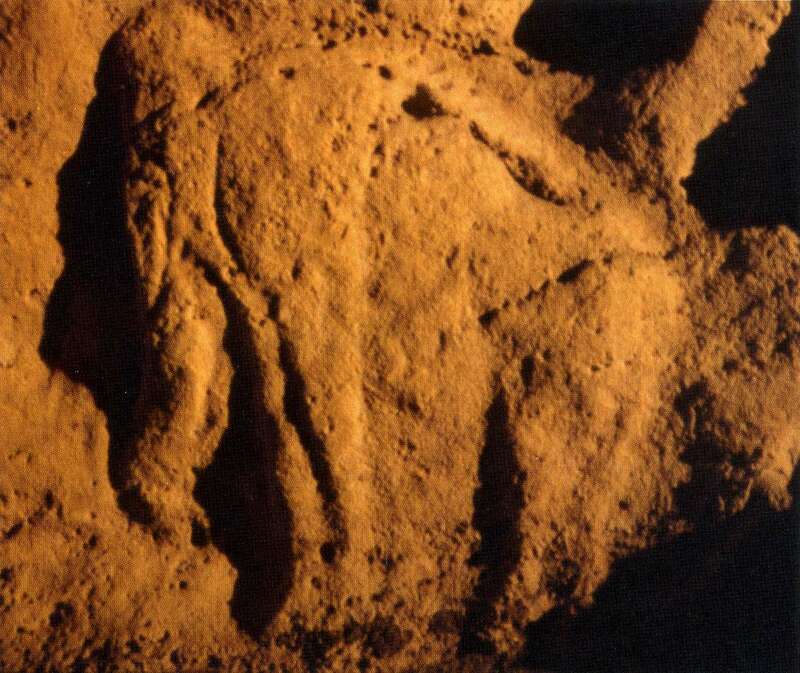 Grotte de Vic, decorated with animal figures. 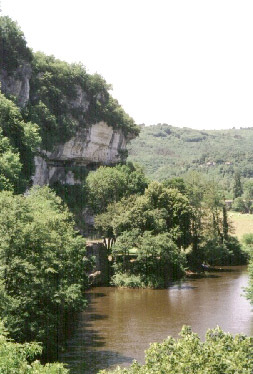 View from Cave Rouffignac. There is a reference to the 'grotto of 100 mammoths' in this cave. 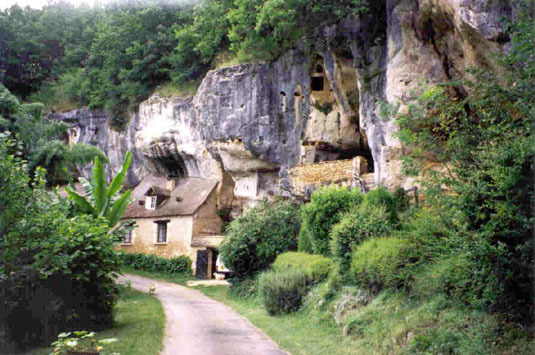 La Roque Gageac located 10 km south of Sarlat. Sean at the hearth. This is a recreation of a bronze age dwelling in the Dordogne Valley, much later than the times detailed in the EC series. 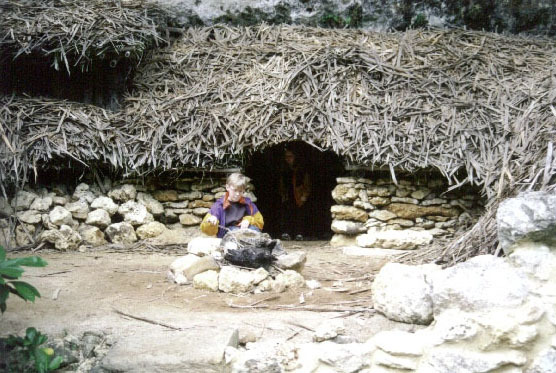 Building houses in this way meant that young families were not dependent on moving in with relatives, often a stressful experience, or finding a new cave, which by that time were non existent - all habitable caves were being used already. You could also site your new 'cave' close to water and game, and could enlarge it as necessary with a minimum of labour. 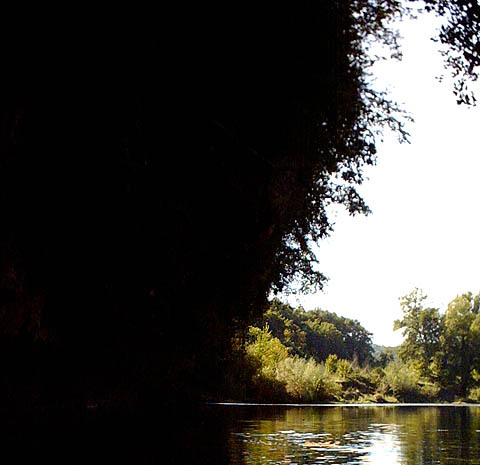 Le Moustier in the Dordogne. Neanderthal man lived in these rock shelters overlooking the small town of Le Moustier, and gave its name to a characteristic Neanderthal tool set and culture, the Mousterian. 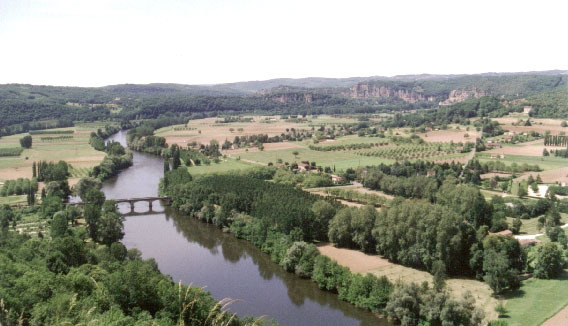 Le Moustier is on the right bank of the Vezere at its confluence with the Vimont valley. Village houses rise in tiers on the rocky steps of the limestone outcrops at the angle formed by the two valleys. 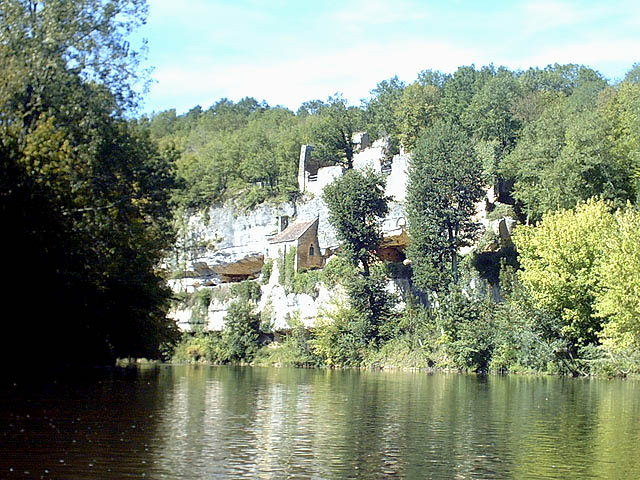 Le Moustier is the name of a village 10 km upstream from Les Eyzies, under the spur of a cliff formed by the intersection of the Vezere and Plazac valleys. The upper shelter has been studied since 1863, and is now completely excavated, so that no further study is possible. The lower shelter is 14 metres below the upper, and occupies the base of the cliff in the village itself, the bedrock being lower than the modern riverbank. It was first excavated in 1907. 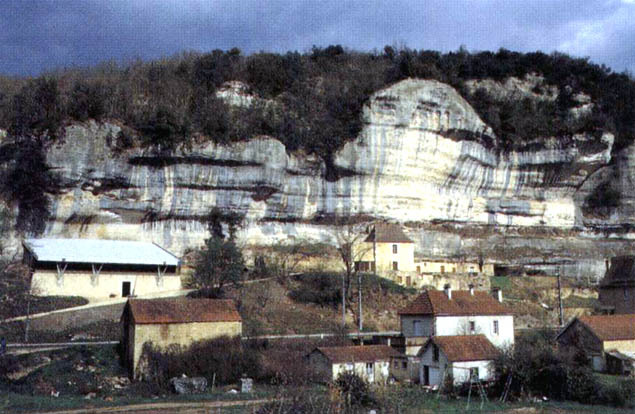 Most recently, Laville and Rigaud conducted well organised excavations there in 1969. The bulk of the deposit has been removed, but a control section for later work remains. Les Fieux, Quercy Region, France. 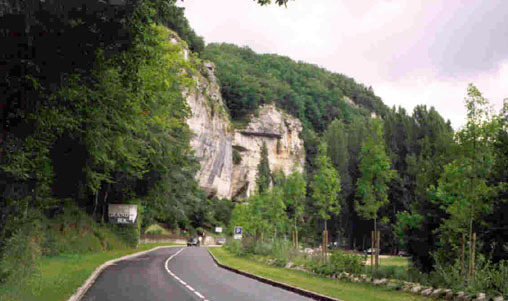 Leaving the spectacular cliffs of the Dordogne valley behind and heading south along the minor roads, a tourist soon finds himself on an and plateau crisscrossed by narrow lanes and drystone walls. This is the upland "causse" country of Quercy, where the thin soil supports a light cover of birch trees, juniper bushes and coarse grasses, attracting thousands of bright butterflies in the summer. It is possible to walk only a hundred yards among the birches and become utterly lost in the featureless scrub, with the distant clatter of sheep bells in every direction confusing the senses further. It is a kind of desert, in fact, which one can scarcely imagine ever to have been prosperous or continuously inhabited. Yet the signs are there: in the clearing around a field boundary here and there loom the massive stones of a megalithic tomb, or "dolmen," in all probability erected by Neolithic shepherds in their summer pasturelands four thousand years ago, and surprisingly there are also the painted caves left behind by the Ice Age hunters. It was in the middle of one such stand of birches, a place impossible to find without a guide, that the cave of Les Fieux was discovered by a group of potholers in 1964. No impressive cliff or porch confronted the explorers, for the entrance was a mere "foxhole" disappearing into the earth beside a shallow depression in the flat stony plateau. In prehistoric times this narrow crack opened onto a broad chamber with a thin roof shattered bit by bit by winter frosts and eventually filled up with sand and the hunters' domestic rubbish. On the surface the only trace to be seen of this was the shallow depression. In the other direction the crack led down into the darkness of the Les Fieux cave. Monsieur Caminade, the landowner, a vigorous man in his eighties, has always led visitors himself into the depths of his cave despite the fact that his powerful shoulders can barely pass through the narrow "foxhole" of the entrance. Crawling along on elbows and knees, one descends from the hot plateau into the coolness of the cave, and at length scrambles into a rather dingy chamber about twenty-five meters long and thirteen meters wide. It is no Lascaux or Altamira: some of the dozen or so painted hand impressions are very hard to see, the triple red dots made by dabbing at the cave walls with three fingers are uninformative, while the only other traces are some extremely worn carvings, apparently representing a pair of ibexes, covering one side of a block lying in the middle of the chamber. It is indeed hard to imagine a great ceremony or gathering taking place here in this claustrophobic chamber where one slides and stumbles among muddy little crevasses and can easily be knocked painfully across the head by bristling stalactites. 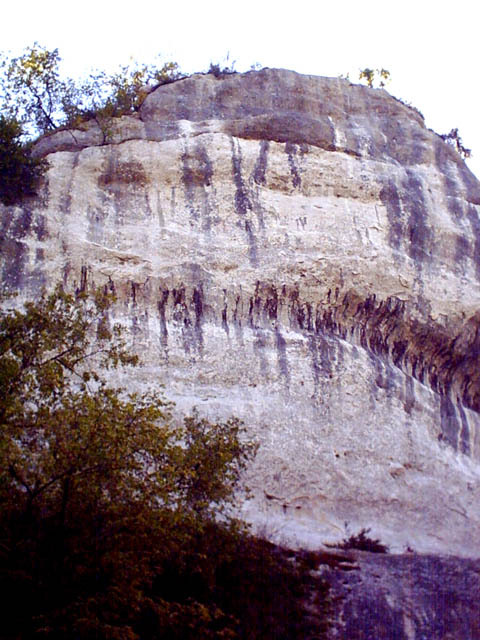 Two intact left hand impressions may be seen faintly in this photograph taken in the cave of Les Fieux in the Quercy region of southwest France. They are clearer in the small image here than in the larger one which has more obscuring detail. It also helps to squint the eyes and sit back from the computer monitor! Les Fieux would not command much attention if it were just an isolated case of a small and poorly decorated sanctuary. 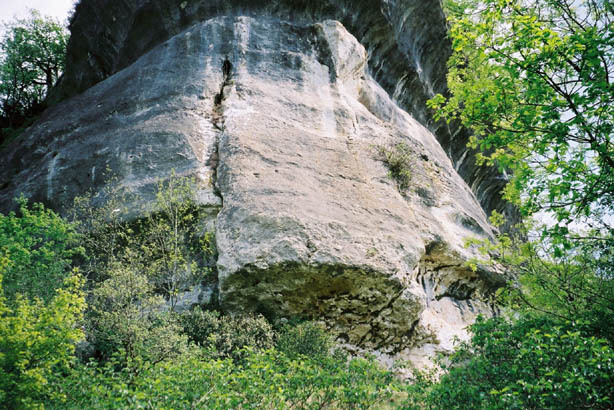 In fact, as a result of careful prospecting during the past decade, nearly a dozen caves, their locations dotted over the dry hills and steep river valleys of Quercy, have been found to contain unimposing paintings or engravings. 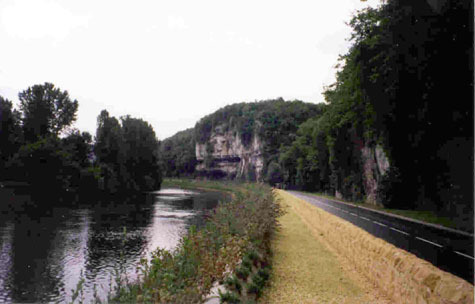 The caves are never more than a few hours' walk from the great rivers, the Lot, the Célé and the Dordogne, but to some extent these recent discoveries fill in blank spaces on the map between caves like Font-de-Gaume near the Vézère and Pech-Merle on the Lot which have long been celebrated tourist attractions. However, no enterprising proprietor could ever turn these new caverns into profitable concerns, for who would pay to see Le Bourgnetou with its almost invisible reindeer carving and its solitary red handprint, or Les Escabasses with its ibex and two sketchy horses hidden among ugly walls of spongy calcite? It has been relatively easy for prehistorians to erect grand theories about the significance of caves like Lascaux where hundreds or even thousands of artworks survive. 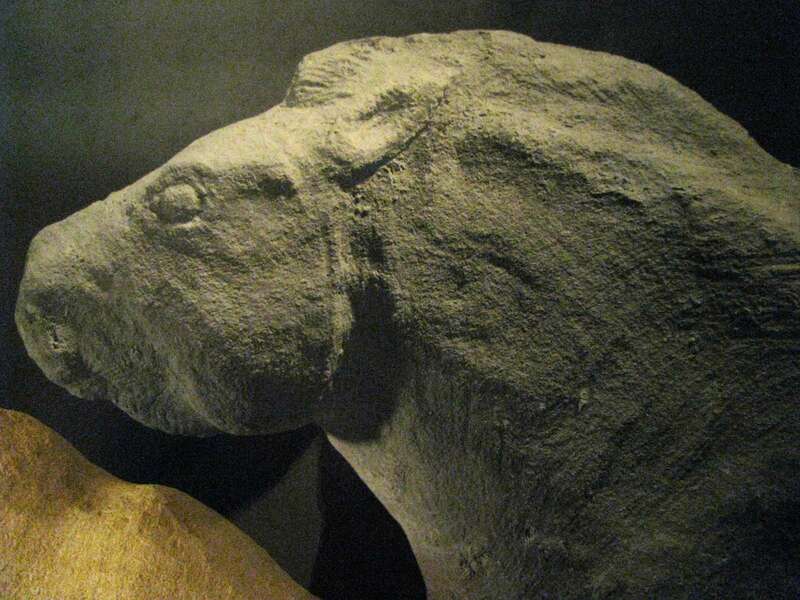 But it is difficult to apply the same ideas to the impoverished scale of decorations in caves like Cuzoul de Mélanie (one engraved bison) or Le Papetier (one engraved bovid and three abstract signs). 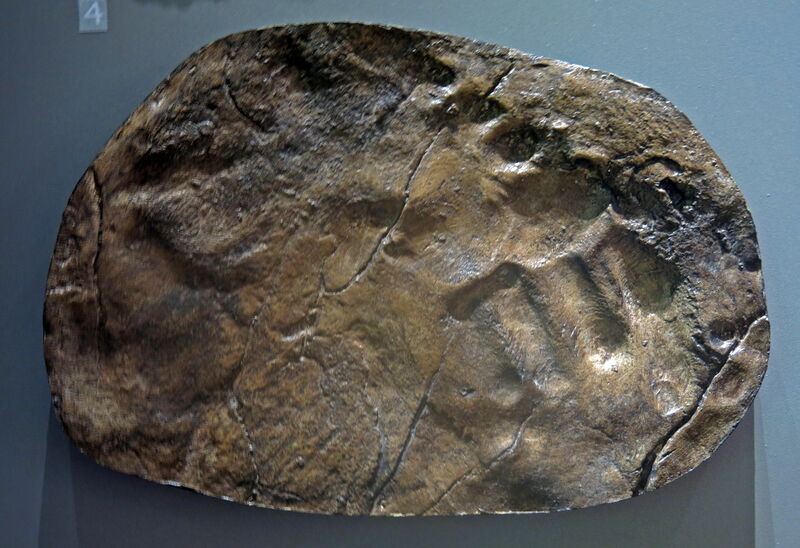 Yet these recent finds demand an explanation no less than did the dramatic discoveries of the past. Perhaps they suggest the activities of solitary artists rather than the settings of great ceremonies. One of the most striking examples of a very small gallery is in the cave of Tibiran in the Pyrenees where paintings and engravings were first noted by the celebrated explorer Norbert Casteret in 1951. From the entrance one slithers alarmingly down a steep muddy slope to the central chamber below. This room is a high-vaulted amphitheater about twelve metres wide, complete with an "upper circle," a high ledge where prehistoric artists left mutilated hand impressions on the wall (Gargas is only a short walk away on the other side of the same hill). The theatrical atmosphere of this chamber is strong, readily suggesting a place of dance or sacrifice to the imaginative. Yet the most interesting works in Tibiran occur not here but in a little cavity joined to the main chamber by an extremely low opening in the rock wall. One slides painfully on hands and knees into the tiny chamber, where there is just room for two people to stand upright. One careless step, a hand flung out to catch one's balance, and the already fragmentary animal paintings could be seriously damaged. The best of these is a vigorous black painted horse, its outline engraved on two separate occasions, while on the adjoining wall a drooping stalactite shaped exactly like a bear's head is joined to a painted body, as if the artist was inspired by the natural relief of the stone. There are also traces of an ibex and possibly another horse. The idea of a large ceremonial gathering in the central chamber may of course be just a fantasy, but it is absolutely certain that not more than two people could ever have squeezed into the cavity with the painted animals at one time. This apparently deliberate selection of an awkward secret place has emerged also from a recent study by two English cave-art enthusiasts, David Collison and Alex Hooper. Together they spent six weeks in 1972 minutely examining the confined walls and ceiling of one small gallery inside a cavern opening onto the spectacular rocky slopes of the Ariège valley, not far from Andorra in the Pyrenees. 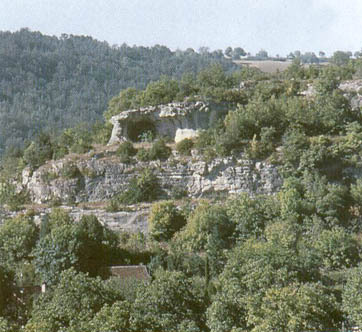 This cave of Les Eglises had been the successive shelter not only of Paleolithic hunters but also of Bronze Age peoples whose fragments of pottery have been excavated from the entrance, and, in the thirteenth century, a sect called the Cathars took refuge from religious persecution in the upper galleries of the cave. Plan of the decorated cave at Les Eglises in the Ariège valley, central Pyrenees. Nearly 100 meters from the entrance and not entirely out of reach of daylight is a small side turning that leads up to the dead end of the painted gallery, where the semicircular roof and walls form a smooth and continuous surface joining the gravel, clay and sand floor. In its final sections the tunnel becomes lower and narrower so that one cannot stand upright, and it is here in this cramped section that there are clustered eighty rather unimpressive red-painted and carved animals, abstract signs, points and lines. To carry out their experiments, Hooper and Collison installed an electric cable nearly a quarter of a mile long to power a series of floodlights and an ultraviolet lamp. Their intention was to study the response of the cave art to wavelengths of light beyond the ordinary visible range, with the aid of the lamps, special filters and infrared film. They hoped to detect normally imperceptible differences in pigments from one painting to the next, and to see if the sketchy and schematic outlines of animals had once been more complete. I have moved the material on the Grotte de Gargas to a page of its own, and added a great deal of extra information and images. Follow the link below. The cave art of Grotte de Gargas constitutes one of the most moving revelations today of the life and thoughts of our prehistoric ancestors. It is made up of two very important elements - painted hands, many mutilated, as well as important animal engravings and paintings.